An article came across my radar: Fish Oil Could Curb Cow Flatulence .. uh? Cue in fart jokes galore, as that's what I'm finding following this thread. But there is a serious story so let's try to think about this rationally. Flatulence (farts) and eructation (burps) from cows and other animals are thought to cause 18% of the greenhouse gasses. I've seen this figure tossed around as a way to dismiss global warming fears as we're all twisted up in knots over the purely natural event of a cow farting or burping in the field. But maybe this isn't a natural occurrence. When a human farts (excessively) it's a sign that something is wrong with his or her digestive system, so maybe excessive cow flatulence or eructation is also a sign that something is wrong with the cow digestion. Further I attended a talk by David Blume last summer (he's a permaculturist who is promoting home grown ethanol fuel) and he claimed cows fed corn have more flatulence than cows fed with more appropriate foods. The root of the problem is that sheep, cows, goats and other so-called ruminants are unique in the way they digest their food. While that allows them to convert more energy from grasses, the process also generates hydrogen as a byproduct. Microbes known as methanogens convert the hydrogen to methane, which then leaves the animal through belching -- and to a lesser extent, flatulence -- and then floats into the atmosphere, where it helps to trap heat and potentially accelerate global warming. Humans emit methane, too, but not so much. They're trying different additives, feeds, supplements, etc. They have special chambers to put sheep into allowing them to measure the, uh, emissions and tell which approach is working and which isn't. Their incentive is that roughly 48% of New Zealand's greenhouse gases come from agriculture and a global move to tighten animal emissions could cause them a headache. The U.S. EPA has a Ruminant Livestock home page. They have a FAQ and a resources and tools page. 1. How much methane is produced by livestock? Globally, ruminant livestock produce about 80 million metric tons of methane annually, accounting for about 28% of global methane emissions from human-related activities. An adult cow may be a very small source by itself, emitting only 80-110 kgs of methane, but with about 100 million cattle in the U.S. and 1.2 billion large ruminants in the world, ruminants are one of the largest methane sources. In the U.S., cattle emit about 5.5 million metric tons of methane per year into the atmosphere, accounting for 20% of U.S. methane emissions. The U.S. EPA also has a page on Methane Sources and Emissions. The three big sources of methane are landfills (our human garbage at work), the mining of natural gas (some of the gas escapes) and livestock enteric fermentation (cow farts). For some reason that last link isn't the full report so let's make the best we can of the Executive Summary. Also note that the wikipedia has a summary of Livestock’s Long Shadow –Environmental Issues and Options. The livestock sector emerges as one of the top two or three most significant contributions to the most serious environmental problems, at every scale from local to global. The findings of this report suggest that it should be a major policy focus when dealing with problems of land degradation, climate change and air pollution, water shortage and water pollution and loss of biodiversity. Livestock's contribution to environmental problems is on a massive scale and its potential contribution to their solution is equally large. The impact is so significant that it needs to be addressed with urgency. Major reductions in impact could be achieved at reasonable cost. There is more here than the flatulence and eructation I've been talking about. Extensive grazing occupies and degrades vast stretches of land. Livestock farming has a very intensive impact on the land and local ecosystem. The total land area dedicated to livestock production accounts for 70 percent of all agricultural land and 30 percent of the land surface of the planet. Expansion of livestock production is a key factor in deforestation. 70% of previously forested land in the Amazon is occupied by pastures and feedcrops cover a large part of the remainder. Livestock production accounts for over 8% of global human water use, mostly for feedcrop irrigation. It is probably the largest sectoral source of water pollution contributing to dead zones in coastal areas, degradation of coral reefs, human health problems, emergence of antibiotic resistance. There are many articles referring to the above research and using that as justification of vegetarianism. There's much evidence that typical (American) diets consumes too much meat. The above research documents the negative effect caused by raising meat. It follows that if the typical diet were more balanced and not so heavy on meat, that meat consumption could decrease, and that would decrease the negative effects of raising meat. Such as a United Nations study written up by the Guardian of London: UN says eat less meat to curb global warming. The UN's Food and Agriculture Organisation has estimated that meat production accounts for nearly a fifth of global greenhouse gas emissions. These are generated during the production of animal feeds, for example, while ruminants, particularly cows, emit methane, which is 23 times more effective as a global warming agent than carbon dioxide. The agency has also warned that meat consumption is set to double by the middle of the century. The Livestock Emissions & Abatement Research Network (LEARN) is an international research network focused on improving the understanding of greenhouse gas emissions from livestock agriculture. The objectives of LEARN are to: To improve understanding, measurement and monitoring of non-CO2 greenhouse gas emissions from animal agriculture at all scales; To facilitate the development of cost effective and practical greenhouse gas mitigation solutions. presents the analysis of the “methane emissions” global impact domain. These emissions include methane emitted directly from livestock digestive processes (i.e., enteric fermentation) and methane emitted from manure management facilities. Ruminant animals, and in particular cattle, are the principal source of methane emissions from enteric fermentation. Liquid manure management facilities, such as lagoons, pits, and storage tanks, are the principal source of methane emissions from livestock manure. In Cows On Diets? 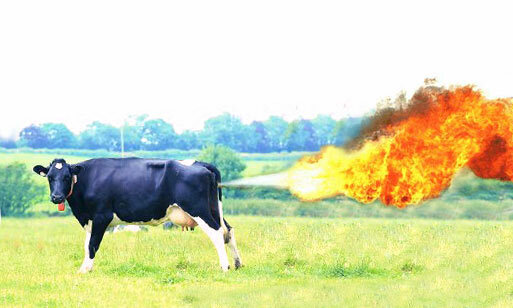 Scientists Study Ways To Reduce Bovine Flatulence is an overview of this situation. It discusses research in Australia into Kangaroo digestive systems, and whether that can be used in livestock digestive systems to mitigate their methane production. It also discusses German research that has created a pill (the size of a tennis ball) that helps cows with their digestion, and increases milk production. Down in Australia Methane emission curb in the wind is news of research from The Beef Co-operative Research Centre that is investigating genetics, feed varieties and rumen microbes in a bid to cut methane emissions by 20 per cent by 2012. Details aside, animal methane does present a definite threat to the biota. It's believed 18 percent of the greenhouse effect is caused by methane, putting it second on the list of offending gases behind carbon dioxide. Methane breaks down in the atmosphere to form carbon dioxide, ozone, and water, all of which absorb heat. The temperature of the atmosphere rises, the ice caps melt, and next thing you know you're pumping the Atlantic Ocean out of your basement. The arctic is melting, the glaciers are melting, and as a result the permafrost is thawing, and as a result massive amounts of methane is being released from the permafrost. It may be that methane sources such as cow eructation are the natural order of things. It is clear though that humans driving cars around is not part of the natural order of things, and it may well be that overconsumption of meat causes more cows to exist and hence more eructation and hence more methane. In other words it is clear to me that human activity added extra greenhouse gas emissions into an existing system, tipping that system just enough to cause enough temperature rise to begin the process of melting the arctic and releasing all that safely sequestered material in the permafrost.